The goal at George Fox University - a Christ-centered school affiliated with the Evangelical Friends Church - is to demonstrate the meaning of Jesus Christ by helping students achieve personal and intellectual growth. About 1700 students attend this school, located in Newberg, about 20 miles from Portland. The wooded, peaceful setting's rich surrounding area produces 90% of the nation's hazelnuts. Describe the type of student who should not attend George Fox University and explain why. Describe the type of student who should attend George Fox University. Why? What is a typical George Fox University student like? Describe the type of person that should attend George Fox University. What are the top 3 reasons someone should attend George Fox University? What was a typical George Fox University student like in high school? Describe the type of person that should attend George Fox University. Someone who wants a type of education that includes religious teachings. You are typically very academically driven, and want to have a well rounded education since it's a liberal arts University. George Fox is Oregon's nationally recognized Christian university, providing students with personal attention, global opportunities to learn and serve, and a supportive community that encourages academic rigor and spiritual growth. We offer bachelor's degrees in more than 40 majors, adult degree programs, five seminary degrees, and 12 master's and doctoral degrees. George Fox is accredited by the Northwest Commission on Colleges and Universities, and in 2010-11 Forbes ranked George Fox in the top 150 colleges in America and among the nation's top Christian colleges. In keeping with our mission of Christian higher education, all employees - faculty, administration and staff - are committed Christians. 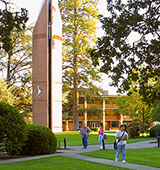 More than 3,500 students attend classes on the university's residential campus in Newberg, at its Portland, Salem, and Boise centers, and at other teaching sites in Oregon. What are the top 3 things that students do for fun at George Fox University? The average student pays $24,404 for tuition, fees, and other expenses, after grants and scholarships. Total stated tuition is $30,770, in-state and on-campus, before financial aid. Learn more about financial aid at http://www.georgefox.edu/offices/sfs/index.html. Estimate the net price for you at http://www.georgefox.edu/college-admissions/scholarships/net-price-calculator.html. The typical (median) early career salary of George Fox University graduates is $40,500, according to Payscale. George Fox University participates in the NCAA Division III for college athletics. Want more info about George Fox University? Get free advice from education experts and Noodle community members.